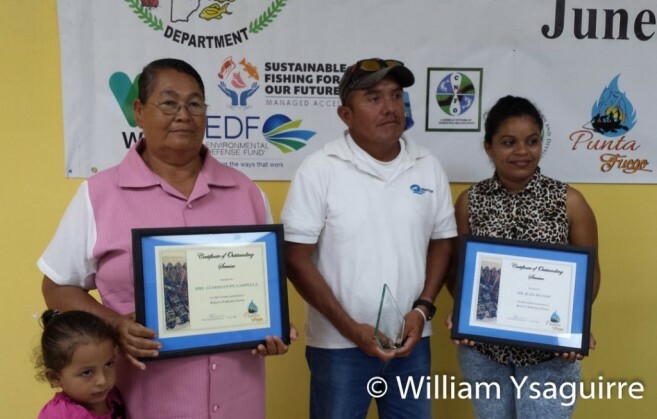 Cesar Munoz of Sarteneja Village, Corozal district was awarded as the 2016 Fisher of the Year, while Mrs. Guadalupe Lampella of Punta Gorda and Juan Munoz of Sarteneja were recognized as outstanding Fishers of the Year as Belize celebrated World Fishermen’s Day on Wednesday, June 29, the feast day of St. Peter, which is observed as a public holiday in many other countries. 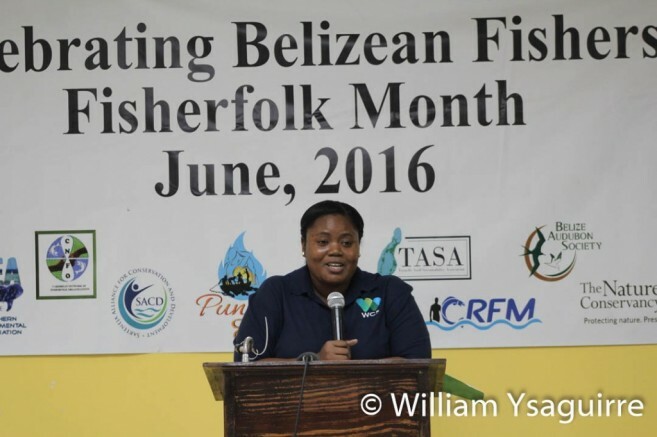 The Wildlife Conservation Society (WCS) and the Caribbean Regional Fisheries Mechanism awarded these three Fishers of the Year in a ceremony at the Coastal Zone Management Institute in Belize City on Wednesday morning. Wildlife Conservation Society Executive Director Nicole Auil presented the awards; as Mrs. Ralna Lewis of WCS cited the recipients’ many accomplishments. Cesar Munoz, a 30-year veteran of this noble profession, has been fishing from when he was 14 years old, and helped establish the Sarteneja Fishermen’s Association (SFA). He is also a member of the Glovers Reef Advisory Committee and a member of the Managed Access Committee for the pilot project in the Glovers Reef Marine Reserve, begun four years ago which has now resulted in the Fisheries Department extending Managed Access areas to all of Belize’s territorial seas on June 15. In seeking to expand income earning opportunities, Cesar identified and helped promote the Lionfish as target species for commercial fishing, which resulted in the women of his village forming the Belize Lionfish Jewellery Cooperative to make jewellery from Lionfish spines. 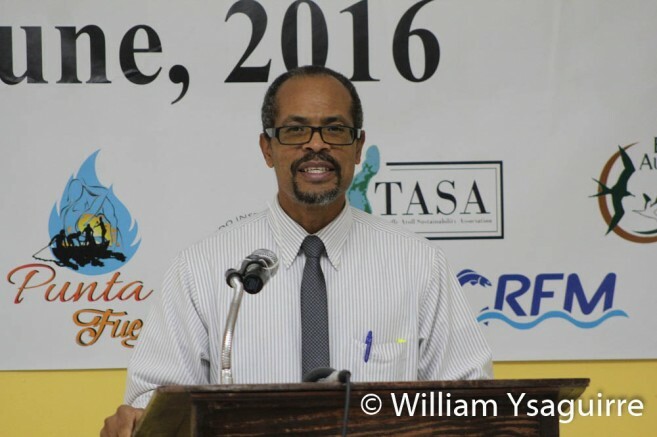 Through his leadership, the SFA recently won a grant from the Protects Areas Conservation Trust (PACT) for a project, “Alternative Livelihoods for Sarteneja: Lionfish and Seaweed,” with the hope to increase Lionfish demand by targeting restaurants throughout Belize and also to promote the sale of lionfish jewellery. The project will also pioneer seaweed farming as an alternative livelihood for Sarteneja fishermen. 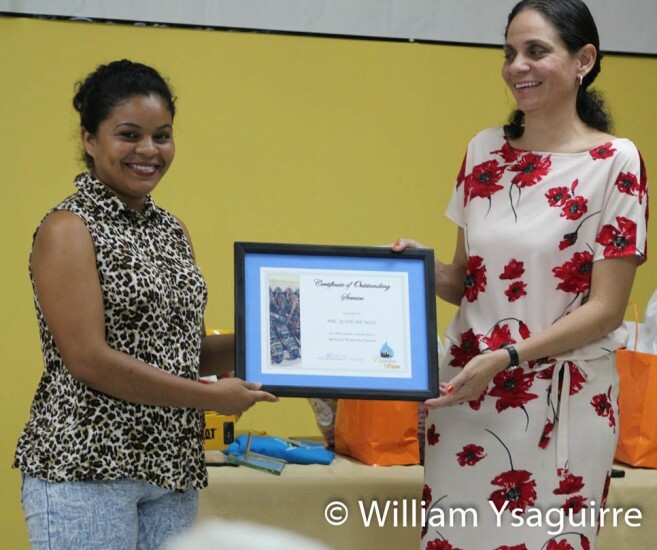 Guadaloupe Lampella, the sister of last year’s Fisher of the Year Anna Ramirez, was also recognized as an outstanding fisher. Born in Punta Gorda town, Guadaloupe grew up on Punta Ycaco, she and her siblings would dive the waters around the coral reefs off Wilson Caye and New Haven with spear rods to strike fish and lobster. Fishing was her logical choice of profession when she came of age, as she could free-dive down to nine fathoms to fish for lobster, conch and occasionally fish in what is now the Port Honduras marine Reserve. 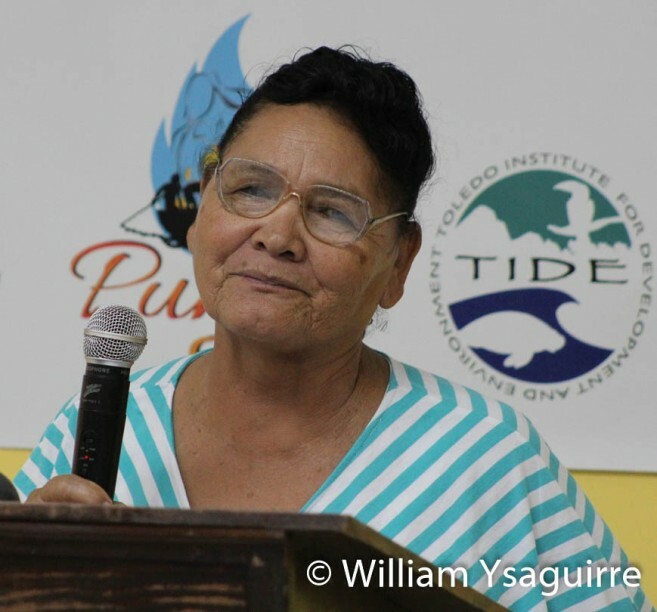 Lampella and her husband moved to Riversdale in 1990, fishing the seas around the Southwater Caye Marine Reserve, where her fishing income helped raise her eight children. Realizing the importance of making her livelihood sustainable, Gaudaloupe became an advocate for all the fishers of her area to unite to protect their fisheries resources. Today she is a grandmother, but still captains her own boat to fish for lobster, conch and sea cucumber. Juan Munoz grew up in Sarteneja, fishing from he was 12 years old; and with his father’s and brother’s help, he built his own sailboat to work the sea. As captain, he was a stickler for abiding by the Fisheries regulations and encouraged his fellow fishers to do likewise. Today, Juan serves as a committee member of the Northern Fishermen’s Cooperative. 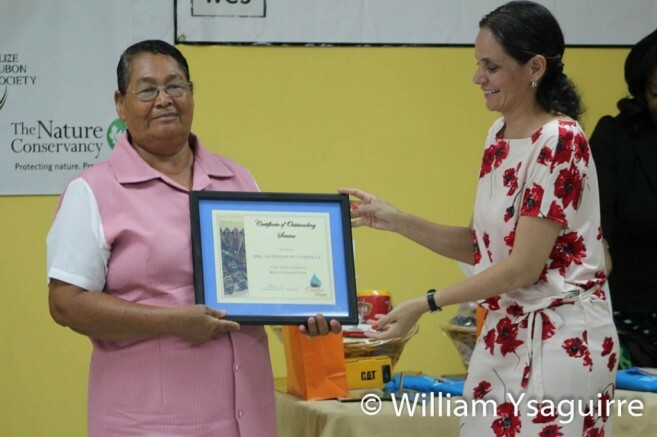 Juan was very busy with the onset of the lobster fishing season, and so his wife Elizabeth received the award on his behalf. 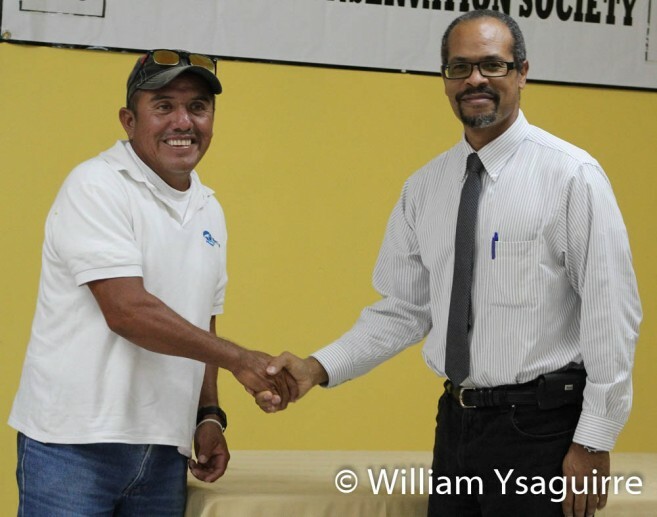 The Fisheries Department is honouring Belize’s fishermen by celebrating the entire month of June as Belize Fisherfolk’s month, and the Executive Director Milton Haughton of the Caribbean Regional Fisheries Mechanism (CRFM) joined Auil in congratulating Cesar Munoz and also presenting him with an award. CRFM has its regional office in Belize. Haughton in his introductory remarks had noted that small scale fishermen had been marginalized in many other countries by large, industrialized fleets and factory ships, but in the Caribbean 97 per cent of the fishing industry remains small-scale and this is entirely true of Belize. He noted that two thirds of all fish and seafood consumed globally comes from small scale fishermen, and that the sector involves women’s participation significantly, particularly in the processing and marketing. Belize’s licensed fishermen number about 2,146, but regionally over 350,000 persons in the Caribbean depend on fishing for their livelihood. Haughton pledged that the CRFM is currently providing technical support to help Caribbean fisherfolk improve their livelihoods, to make their fisheries sustainable, battle illegal fishing and improve Sanitary and Phyto-sanitary standards to help them access more lucrative markets in the European Union, while also helping them buffer their industry against the effects of climate change and to manage other natural disaster risks. In addition to the WCS and CRFM awards, the Fishers of the Year also received gift packages from several corporate sponsors, including Speednet Communications, Grace Kennedy Belize, Marelco, several nongovernmental conservation agencies and Punta Fuego II, the second season of a radio program produced by WCS. Fisheries officer Mauro Gongora added the Fisheries Department’s congratulations to the honoured fishermen. He noted the economic importance of the Fisheries sector, with Lobster tail production increasing from 460,820lbs in 2014 with exports of 452,930lbs earing $13.4 million; to 638,012lbs in 2015, of which 536,863lbs were exported, earning $16 Million. Whole lobster fetches a much better price, at US$10 per lobster, as opposed to US$10.00/lbs for lobster tail, he reported that production had quadrupled from 72,212 in 2014, to 306,44lbs of whole lobster exported in 2015. Conch production has also increased from 739,270lbs in 2014, to 751,360lbs in 2015, of which 696,350lbs were exported earning another $8.2 Million. 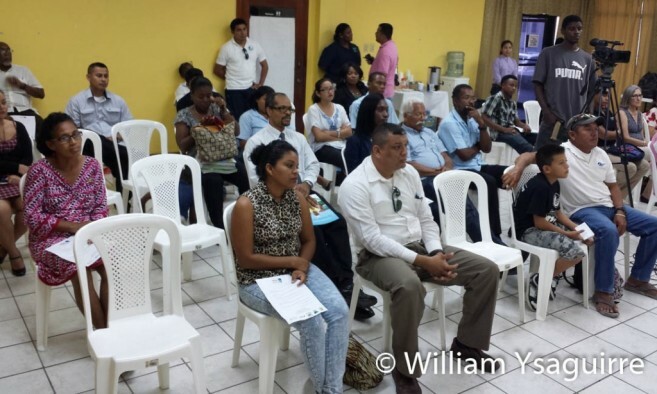 Gongora said he looked forward to the Department and fishermen working together in partnership to protect this important sector, whose earnings directly benefits some 15,000 Belizeans. He also called for moment of silence for Sarteneja fisherman Eugenio Santos Sr, who drowned a few days ago during a storm while fishing off Turneffe atoll.